Michaelston-y-Fedw CIC has won the European Broadband Award for Innovative Models of Financing, Business and Investment. 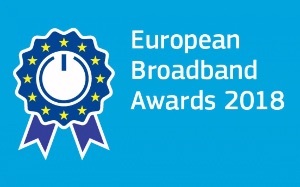 We were one of three finalists shortlisted for the award, the other two being Broadband Initiative of the District of Calw, Germany and Superfast Internet for all homes and businesses in the rural area of Noordoostpolder, Netherlands. MyFi was represented at the Awards Ceremony in Brussels by Jim and Carina Dunk where a jury of five broadband experts decided we deserved the award because of our clever approach to funding and building a full fibre network in a challenging rural location. Ultra-Fast Broadband for Michaelston-y-Fedw is GO! Michaelston y Fedw Internet CIC, a not for profit Community Interest Company, was incorporated in October 2017 wholly for the purpose of installing 1Gbps Fibre To The Premises ‘FTTP’ to residents and businesses in and around Michaelston-y-Fedw. Meetings, discussions and debates started back in August 2017, the real work began on this community broadband scheme on 21st February 2018 . The first live connections were achieved mid June 2018 and completion of all 180+ connections is expected by late autumn. We are the first rural community built 1 Gb fttp network in Wales. We lead the field in affordability, equal upload and download speeds, bringing the Community together in both digital and analogue environment, and we have the capability to deliver 10 Gbps. With upgrades in the future we are capable of delivering 100 Gbps or 100,000 Mbps. All in all a fantastic achievement. As a community project, contractors have been employed for some of the work. Teams of volunteers from the community have been utilised in activities such as digging chambers, laying out of ducting, fitting out The Hub, fusion and splicing of fibres, router installations, and as many tasks as possible in a bid to keep overall costs to a minimum. This has enabled every connection to be provided with the aid of ABC and UVC Broadband Grants from The Welsh Government (Superfast Cymru) with no additional cost to the residents. Investors have provided initial start up capital which will enables us to purchase materials and services until the grant funding is paid at completion of live connections. Additionally, Landowners and Farmers throughout the Michaelston-y-Fedw village and surrounding areas have generously given wayleaves across their land for the trenching and laying of ducting for the Fibre, thus enabling around 170+ properties to be connected. Without their generosity we would not have been able to even consider commencing this project from the outset. We have given the work of trenching to local contractors rather than bringing in resources from outside the community and have been fortunate that suppliers have been generous with products thus supporting our community project. As a community we are so very proud of everyone who is involved with this project, it is an amazing success story and sets a fantastic example of how a community can get together and achieve what the commercial providers were not interested in doing. Below is a map showing the planned routing for the cables. Red stars are properties where installation is complete. Red dots have indicated that they will connect. Yellow dots have not signed up. Red line is under construction. Blue lines are yet to construct. Further information about the project will be published as it becomes available on the Progress Page.